Only 6.7% of women graduate with STEM degrees. When we encourage girls to pursue STEM, we double our potential for innovation. Microsoft launched a new movement last year calling on girls to #MakeWhatsNext. The campaign raises awareness of the issues that cause girls to drop out of or lose interest in STEM, and aims to pique their excitement in how they can change the world — if they stay engaged. Additionally, to help shift perceptions about STEM jobs, Microsoft and LinkedIn launched a new experiential tool in conjunction with the campaign to demonstrate how girls can pursue their passions across industries and social causes. The RISE program supports and connects not-for-profit organisations around the world to increase equity in computer science education with a focus on girls, minorities who are historically underrepresented in the field, and youth from low-income communities. Made with Code is an initiative with an aim to empower young women in middle and high schools with computer programming skills. Made with Code was created after Google’s own research found out that encouragement and exposure are the critical factors that would influence young females to pursue Computer Science. This year the tech giant announced that they'd teamed with Wonder Woman to inspire teen girls to learn coding. Using drag and drop blocks of code that comprise actions, objects and variables, those new to coding can see how the different aspects of code fit together to create a finished product. Young coders can use these code blocks to help Wonder Woman overcome obstacles in her path and reach her goals. It's not the first time Made With Code has partnered with a new film to teach girls to code; it did so previously with Pixar's Inside Out. 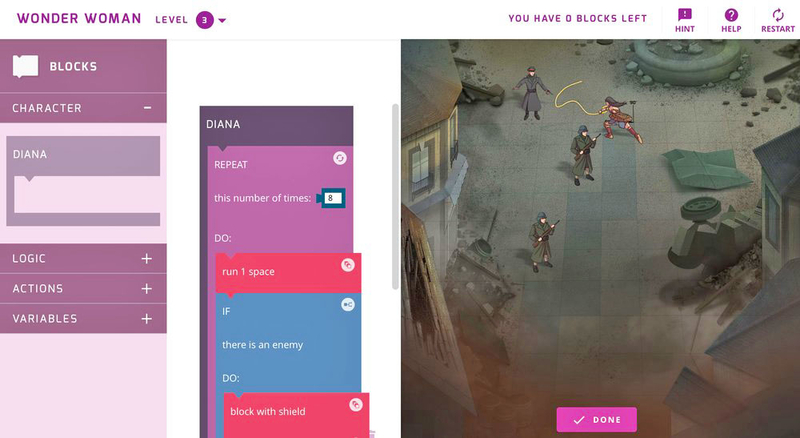 Young coders can use these code blocks to help Wonder Woman overcome obstacles in her path and reach her goals. It's not the first time Made With Code has partnered with a new film to teach girls to code; it did so previously with Pixar's Inside Out. LEGO Education WeDo 2.0 makes science, technology, engineering, mathematics, and coding come to life. The unique combination of the LEGO brick, classroom-friendly software, and engaging, standards-based projects results in a resource that builds students’ confidence to ask questions, define problems and design their own solutions by putting STEM learning directly in their hands. Big Bird and Elmo are getting a tech savvy upgrade. IBM on Wednesday announced a three-year partnership with the nonprofit that produces “Sesame Street” to develop educational products for pre-schoolers, including a smart Elmo doll and software personalized for specific learning needs. Pathways for Technology Early College High School (P-TECH), IBM's technical high school in Brooklyn, NY, is training a new generation of tech talent.Founded in 2011, P-TECH focus on training students from local, low-income communities in STEM topics with the aim of addressing the need for more of these skills in the workforce. The series is a company-wide cross-promotional brand event that aims to teach viewers and kids about the science needed to land on Mars. Nat Geo is using the series to cement a company-wide repositioning as the content leader in science, exploration, and adventure, under the tagline “Further,” and unifying its brand across platforms, global channels, and joint venture with 21st Century Fox. Beyond the singular storytelling approach, Mars will involve its largest cross-platform effort to date to educate viewers and inspire STEM education. It includes a National Geographic magazine cover story, coffee-table book, virtual reality experience, Royal Observatory Greenwich exhibit in London; global screenings in Europe and Mexico; children’s media and related educational materials; ongoing coverage on the Nat Geo website and social media, and a now-streaming digital series, Before Mars, chronicling the backstory of key characters.